It’s been a while since I wrote something for my blog. Many reasons which I may even put down at some point. In the meantime here it is, a first post in a while and for those who know me, it seems right that music should be what gets me going again. Pete Townshend (guitar legend from The Who) recently talked in depth at Salford Media City about music and the impact of digital technology on the music industry. It was picked up by a number of news outlets thanks to the headline grabbing statement that Apple and iTunes were bleeding artists dry like a “digital vampire”. The essence of his argument was that in days gone by, record companies provided a whole host of services for their fee, few of which iTunes provides despite taking a healthy cut of artist’s sales. His insinuation was that iTunes doesn’t give as much as it should for the money it takes. I completely agree. iTunes DOES charge too much for the music it distributes. Albums on iTunes are sold at broadly similar prices to what they are in stores without many of the costs – think packaging, production, distribution. There’s no need for them to be that expensive. Pete went on further and talked about how the digitisation of music has made stealing music so much easier, and whilst on the one hand artists should be pleased that their work is being heard by more people than ever before, on the other hand a mechanism needs to exist to be paid for their music. Physical media sources through which we consume music have always followed a (largely) linear product trajectory. The LP/vinyl was replaced by the audio cassette, replaced by the CD, replaced by digital media. Only digital media hasn’t JUST replaced the CD as the next product form – if it had done so, we wouldn’t be having this digital debate because the same retail model would apply. Digital media has CHANGED the model we have to apply to music. The difference between vinyl, cassette, CD’s, MiniDiscs etc was just in the physical form. The MODEL itself was generally the same – you produced a physical product, you sold it. The lack of a physical product in the digital era and the ability to distribute music without a physical product, to an unlimited degree and with zero marginal unit cost means we have to change the models we apply to the monetisation of the music industry. That isn’t happening. Digital music is still being considered according to physical product rules. Why? 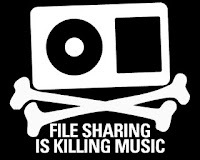 Of course, there needs to be a solution to the problem of pirating music. That’s not being disputed. But at the same time, why is no one focusing on trying to maximise those elements of music that can’t be digitised? There needs to be renewed focus on making people “hear” music, rather than just “listen” to music. Make experiencing the music as fundamental to the enjoyment as listening to it. Legislation was passed to cover Napster probably years after the world had moved on from using Napster, past Limewire & Gnutella and onto torrents. It’s always playing catch up. There’s no point trying to fight piracy in this way, because it’s too far ahead. Why don’t we use technology to beat technology? Or maybe mix technology with changing user attitudes and behaviour to beat technology. Think Spotify and streaming music. That’s legal, digital and being accepted by users. Win-win all round. I don’t pretend to have all or any of the solutions. If I did, I wouldn’t be here talking about them, I’d be “doing” them. But I’m bored of yet another talk by a well known personality about yet another nail in the coffin of the music industry delivered by digital music. Digital music is here, and digital media has won. It’s not going away, and because it’s how we consume music at home and on the move it’s becoming a more integral and ingrained part of our life with every day that passes. Isn’t it time stop trying to fight it, and instead figure out how we can make it work for us in the way we want it to so everyone benefits? I think so. Agree or disagree?